Jacqueline F. on Friesian gelding: "I can recommend the saddles of Iberosattel to 100% ..."
"I would like to briefly tell you my positive experiences with the world's most beautiful saddle and I hope it will make it easier for you to arrange a saddle check-in date. I have a Friesian gelding with very short, square back and predisposition to the lower back (external due to too short or behind the front leg). The saddle search was 5 years ago a nightmare, because as a physiotherapist, the back of my friesian is the most important! Countless dressage saddles with unfortunately mostly V-shaped headphones and too long saddle-tree were the problem, as well as the wedge cushions, which always poked too punctually into the backstretcher. Until one day I hit on Iberosattel. I agreed in March 2012 an appointment for the preparation and was immediately enthusiast of the Iberosattel team. A super competent advice from Patrick and Birgit Thoma! I chose the Amazon Dressage Comfort in black with red piping and seam after extensive preparation for the Amazon Dressage Comfort. To this day, I am enthusiastic and continue to recommend him. 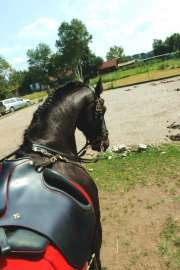 My Friese has no back problems, because the wide comfort pad is super back-friendly. The saddle is 3 to 4 times a week in use and still holds up to today what it promises. I can recommend the saddles of Iberosattel to 100%."